Kaylie Jones Books, 9781617751943, 307pp. "Exceptionally readable and highly recommended." "Engaging first work from a writer of evident ability." "Marian Elliot Adams'...tale is contagiously enthusiastic." 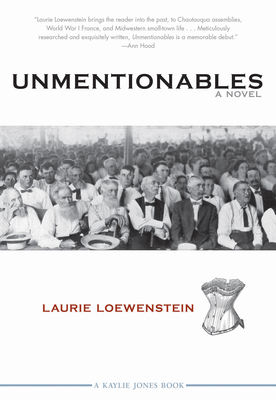 "Unmentionables is a sweeping and memorable story of struggle and suffrage, love and redemption...Loewenstein has skilfully woven a story and a cast of characters that will remain in the memory long after the book's last page has been turned." "Readers will be fascinated by this timeless glimpse into a slice of American history on the brink of significant change, whose memorable characters are both vulnerable and engaging. I loved this book "
"Unmentionables starts small and expands to touch Chicago and war-torn France as Laurie Loewenstein weaves multiple points of view together to create a narrative of social change and the stubbornness of the human heart." "A historical, feminist romance in the positive senses of all three terms: a realistic evocation of small-town America circa 1917, including its racial tensions; a tale about standing up for the equitable treatment of women; and a story about two lonely people who overcome obstacles, including their own character defects, to find love together." --Milwaukee Journal Sentinel, "96 Books For Your Summer Reading List"
Marian Elliot Adams, an outspoken advocate for sensible undergarments for women, sweeps onto the Chautauqua stage under a brown canvas tent on a sweltering August night in 1917, and shocks the gathered town of Emporia with her speech: How can women compete with men in the work place and in life if they are confined by their undergarments? The crowd is further appalled when Marian falls off the stage and sprains her ankle, and is forced to remain among them for a week. As the week passes, she throws into turmoil the town's unspoken rules governing social order, women, and Negroes. The recently widowed newspaper editor Deuce Garland, his lapels glittering with fraternal pins, has always been a community booster, his desire to conform rooted in a legacy of shame--his great-grandfather married a black woman, and the town will never let Deuce forget it, especially not his father-in-law, the owner of the newspaper and Deuce's boss. Deuce and his father-in-law are already at odds, since the old man refuses to allow Deuce's stepdaughter, Helen, to go to Chicago to fight for women's suffrage. But Marian's arrival shatters Deuce's notions of what is acceptable, versus what is right, and Deuce falls madly in love with the tall activist from New York. During Marian's stay in Emporia, Marian pushes Deuce to become a greater, braver, and more dynamic man than he ever imagined was possible. He takes a stand against his father-in-law by helping Helen escape to Chicago; and he publishes an article exposing the county's oldest farm family as the source of a recent typhoid outbreak, risking his livelihood and reputation. Marian's journey takes her to the frozen mud of France's Picardy region, just beyond the lines, to help destitute villagers as the Great War rages on. Helen, in Chicago, is hired as a streetcar conductor surrounded by bitter men who resent her taking a man's job. Meanwhile, Deuce struggles to make a living and find his place in Emporia's wider community after losing the newspaper. Laurie Loewenstein grew up in the flatlands of western Ohio and now resides in Rochester, NY, where Susan B. Anthony was arrested for voting in 1872. Unmentionables is her first novel. Kaylie Jones is the award-winning author of five novels and a memoir. She teaches writing at two MFA programs and lives in New York City.